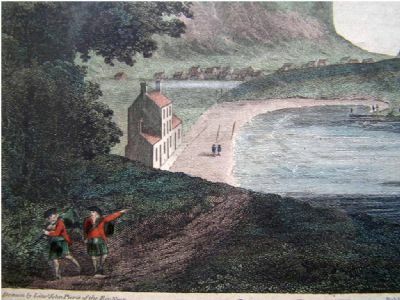 A close up of the township of Lag a' Bhaile (in the background) from the British Fisheries society print of 1789. This township by 1805 was cleared of people and then replaced by a single farm at Coroghon. Where Coroghon Barn still stands to this day. By the West end of Canna he is referring to the townships of Tarbert and Garrisdale. The MacKinnon of Corichatachan was Lachlan MacKinnon of Corichatachan, Isle of Skye. At this time the island of Canna was under the ownership of John MacDonald of Clanranald whose mother was Flora the daughter of MacKinnon of MacKinnon. The MacKinnons were also Jacobites.